Home » Food and Nutrition » Pumpkin Pie Benefits: Is Your Favorite Thanksgiving Dessert Healthy? Pumpkin pie is a staple at many holiday feasts due to its spicy aroma. Some believe that pumpkin pie is healthy due to its nutrient-rich pumpkin puree. That being said, pumpkin pie is still a dessert that contains added sugar and fat. Moderation is important; therefore, you should stick to one piece of pumpkin pie for Thanksgiving dessert. Let’s dig into the basics of pumpkin pie nutrition facts, the health benefits of pumpkin pie, and why pumpkin pie may not be the best Thanksgiving dessert option. What do you need to know about pumpkin pie nutrition? Pumpkin pie calories, nutritional content, and ingredients will depend on where you purchase your pumpkin pie. You may also decide to make your own pumpkin pie from scratch; in which case, you can choose organic ingredients for a pie free of common allergens, saturated fat, and added sugar. Many of the store-bought pumpkin pies will include allergens such as wheat, gluten, soybeans, eggs, and milk. These pumpkin pies will also contain potentially harmful ingredients such as carrageenan, vegetable oil, polysorbate 60, and mono- and diglycerides. I recommend pumpkin pie made from organic puree and minimal ingredients. There should also be a BPA (bisphenol A)-free can lining. Ingredients from an organic pumpkin pie mix will include organic pumpkin puree, organic cane sugar, organic cinnamon, organic nutmeg, organic ginger, organic cloves, and organic allspice. Some of the pumpkin pie benefits come from certain nutrients within the pie, including vitamin A, vitamin C, calcium, and iron. A half-cup of organic pumpkin pie mix contains 148 calories, 35 grams (g) of total carbohydrates, 1 g of fiber, 1 g of protein, 14 g of sugar, and 0 g of fat. Is pumpkin pie too good to be true? Some people may ask, “Is pumpkin pie fattening?” Pumpkin pie benefits will all depend on how this Thanksgiving dessert is made. Pumpkin is full of minerals, vitamins, and fiber that provide a number of amazing health benefits. For instance, the fiber in pumpkin is not only important for heart health, but it also helps control hunger by creating a feeling of fullness. Let’s further examine the key health benefits of pumpkin pie and the various minerals and vitamins contained within. Pumpkin is absolutely loaded with antioxidants, especially the vitamin A precursor known as beta-carotene, which is found in most yellow and orange vegetables. Pumpkin also contains other fat-soluble vitamins that include vitamin A, vitamin E, and vitamin K, which promote blood clotting, bone and teeth development, night vision, and healthy skin. Other vitamin content in pumpkin pie will include vitamin C, choline, vitamin A, vitamin B2, vitamin B3, vitamin B5, and folate. Key minerals contained within pumpkin include calcium, phosphorus, and iron. These minerals benefit muscle contraction, blood clotting and blood oxygenation, and metabolic health. Pumpkin also contains magnesium, potassium, zinc, copper, manganese, and selenium. Pumpkin is rich in fiber, and this helps slow digestion. This gives you the feeling of being full for a longer period of time; therefore, you have less desire to eat a late night snack after your Thanksgiving dessert. Pumpkin is rich in the vitamin A precursor beta-carotene, which is what gives pumpkin its bright orange color. The beta-carotene is converted to vitamin A, which is essential for eye health. Pumpkin also contains two antioxidants called zeaxanthin and lutein that are known to help prevent cataracts. These antioxidants may also slow the development of macular degeneration by preventing oxidative stress. Oxidative stress plays a major role in the degeneration or nerves and cells in the macula and retina. Pumpkin can also help boost the immune system. The beta-carotene can help fight viruses, infections, and various infectious diseases. At the same time, pumpkin seed oil is beneficial for fighting certain fungal and bacterial infections. The vitamin C loaded in pumpkin is also very helpful for recovering your colds or the flu. The beta-carotene in pumpkin can help protect you from ultraviolet (UV) rays, which can cause wrinkles. Pumpkin puree is also thought to make a great natural facemask that helps sooth and exfoliate the skin. Beta-carotene in pumpkin may also reduce your risk of certain cancers. A beta-carotene-rich diet may reduce cancer types like lung and prostate cancer. A study from 1999 published in the journal Archives of Otolaryngology found that beta-carotene benefited patients with oral leukoplakia—a condition where thickened, white patches form on the gums and inside the cheeks. Although benign, leukoplakia may be an early sign of cancer. Can pumpkin also help diabetics? Pumpkin has been shown to improve glucose tolerance, lower blood sugar levels, and increase the amount of insulin the body produces. Is Pumpkin Pie Good for Your Health? We have detailed the benefits of pumpkin, but is it really good for your health when made into a pumpkin pie? The many health benefits of pumpkin make it easy to assume that pumpkin pie is just as healthy for you. The truth is that the average pumpkin pie contains ingredients that are not so good for us as well. Although pumpkin contains important antioxidants like beta-carotene, canned pumpkin can sometimes be a problem. Pumpkin pie cons will include the common fatty ingredients like butter and cream cheese, traditional pastry crust, brown sugar, enriched bleach flour, shortening, salt, high fructose corn syrup, hydrogenated cottonseed oil, soybean oil, and other harmful food chemicals and preservatives. All of this can sabotage the nutritional value of your pumpkin pie. Rather than deal with the nightmare that is conventional canned pumpkin puree, you might want to purchase organic pumpkin puree with natural ingredients. Alternatively, you can make a pumpkin pie with a homemade pumpkin pie puree without any unnecessary additives. You can also use it for other pumpkin recipes, such as smoothies, soups, breads, pancakes or chia puddings. Cut a small, 8-inch pumpkin in half and remove the seeds. Slice the pumpkin in quarters. Roast the pumpkin at 350°F for 75 to 90 minutes. Remove it from the oven and allow it to cool. Peel the skin and puree the pumpkin flesh in a high-speed blender or a food processor. You will get about two cups of puree from this recipe, and it will last for about a week in the refrigerator. Pumpkin pie is a favorite Thanksgiving dessert of many. 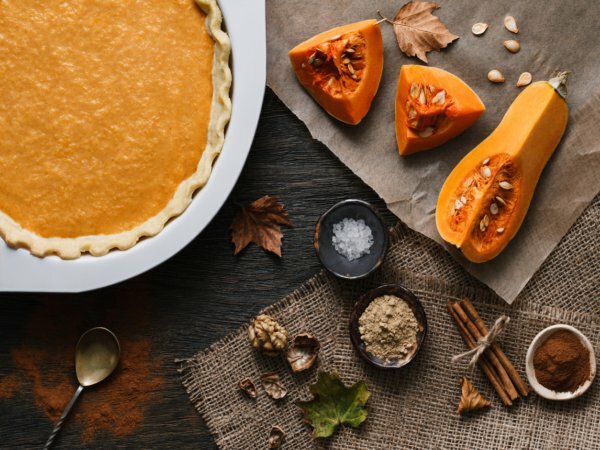 You may even be surprised to learn that potential pumpkin pie benefits include eye health, weight loss, skin health, immunity, and a possible decrease in the risk of diabetes and cancer. But, the type of canned pumpkin you get it is very important. Store-bought pumpkin pie and conventional pumpkin pie puree will contain added sugar, saturated fat, and common allergens like gluten, wheat, milk, eggs, and soybean. Alternatively, organic pumpkin puree is the way to go, or you can make your own pumpkin puree for a homemade pumpkin pie using the recipe provided. I would never tell you not to eat pumpkin pie for Thanksgiving. However, when it comes to your pumpkin pie, the ingredients definitely matter. This way you can enjoy every bite without having to worry about your Thanksgiving dessert. “Pumpkin Pie,” Food Pro; http://www.foodpro.huds.harvard.edu/foodpro/label.asp?locationNum=03&locationName=Cronkhite+Center&dtdate=9%2F4%2F2015&RecNumAndPort=185060*1, last accessed Nov. 21, 2017. “Farmer’s Market Foods, Organic Pumpkin Pie ix, 15 oz. (425 g),” iHerb; https://ca.iherb.com/pr/farmer-s-market-foods-organic-pumpkin-pie-mix-15-oz-425-g/32846, last accessed Nov. 21, 2017. “Health Benefits of Pumpkin Pie,” SFGate; http://healthyeating.sfgate.com/health-benefits-pumpkin-pie-4215.html, last accessed Nov. 21, 2017. Garewal, H.S., et al., “beta-carotene produces sustained remissions in patients with oral leukoplakia: results of a multicenter prospective trial,” Archives of Otolaryngology—Head and Neck Surgery, Dec. 1999; 125(12): 1305-1310; PMID: 10604407. Amidor, T., “Which is Healthier: Pumpkin or Pecan Pie?” Healthy Eats; http://www.foodnetwork.com/healthyeats/2012/11/which-is-healthier-pumpkin-or-pecan-pie, last accessed Nov. 21, 2017.